My early career as a hairdresser in my hometown of Brescia, Italy taught me to shape hair with my hands. In my spare time I studied drawing, and oil and porcelain painting. After immigrating to the United States I was swept up in the world of artistic expression through shaping and glazing clay and studied ceramics in the ASUC studio at University of California Berkeley. 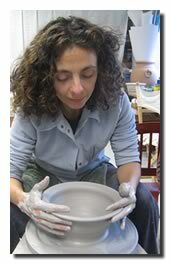 I explored many techniques used in ceramics: pit fire, raku, high fire, stoneware, low fire, tile making and sculpture. Through these experiences I found a path to combine my two loves - shaping and painting - by practicing an old Italian tradition, Maiolica. 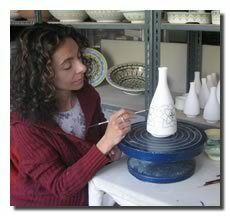 Ten years ago I started an intensive immersion in Maiolica by studying with masters in Faenza and Florence, Italy. I handcraft my clay shapes and then paint and fire them with my unique designs.